In mythology, fairies (fae) are easily one of the most confusing and misunderstood creatures. From the first mention of the classic fairy archetype to the more modern imaginings, few mythical creatures have been reclassified so many times by so many cultures. In this article I plan on sorting through these different definitions to once again come up with a single concept for the modern fairy. We will answer questions such as “which creatures count as fairies” and “what does fae mean”? By the end of this article my hope is that you will have a solid understanding of the difference between modern fairies and everything else. Before we begin, though, we need to acknowledge the most commonly confusing element to discussing fairies and that is the spelling. The word “fairy” originates from the French “faerie”, a spelling which is still used occasionally to this day. In addition, fairies as a whole are also known as “the fae”. So what does fae mean? It’s a term which both describes both what they are physically and who they are culturally. The fae, in the broadest sense, are all those who belong to the order of fairies, including those creatures which seem to be disconnected from the classic fairy archetype and are likely to not match mentally with most people’s images of what a fairy or faerie really is. That said, fairies (fae), in the most commonly understood sense can be best described as small humanoid creatures who have thin, membranous wings and generally tend to stay away from humans. This definition is very similar to the classic fairy, but tends to get stretched out when we are talking about other creatures that can fall into the category of “fae”. Modern fairies tend to have an iridescent glow to them and many are considered at least partially immortal. Unlike other immortals, though, fairies are not indestructible. Their immortality is best described this way: fairies can be killed, but they do not die of natural causes. That is, even though they most certainly can die, they won’t die of old age or a natural failure of the body. In this way, many fairies are considered to be hundreds, if not thousands of years old. It should be mentioned that we are primarily talking about Celtic fairies here. 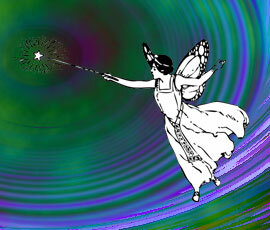 Though the fae appear in the mythologies of other cultures, the classic fairy is Celtic in origin. Even then we have multiple creatures just in the Celtic pantheon that were at one point considered fairies as well. The most common among the Celtic myths are pixies, elves, banshees, brownies, goblins, and leprechauns. Other countries also have creatures that were later considered to be of the Fae, including satyrs, nymphs, valkyries, gnomes, sylphs, and even dwarves. As you can see the definition of fairies (fae) gets a little out of control. It’s no wonder that the term “fairy tale” was used to describe stories of various types of creatures other than the classic fairy. To this day we use the term “fairy tale” to refer to a children’s story of a mythical nature regardless of whether or not the tales are actually about fairies or the fae. The details of what modern fairies are like are equally varied. In some tales fairies are light hearted and helpful while in others fairies are represented as dark and evil creatures. In most cases fairies tend to keep their distance from humans, though they seem to sometimes make the exception for small children. They tend to be playful and mischievous, which probably contributed to the idea that they were less than helpful to adult humans. In most cases fairies keep to themselves and most often live in either dense woods or sometimes below the earth itself in what are known as “fairy mounds” - large piles of dirt with tunnels dug beneath. The most popular modern fairies are fictional. Tinkerbell from Peter Pan, Cinderella’s Fairy Godmother, and the Tooth Fairy are all modern representations of the classic fairy whose mythology started and ended the same, but had some strange interpretations in between. Want to see more mythical creatures? Check out the List of Mythical Creatures.